A lead is a prospective customer of our sales or service. For a successful sales/service company, Lead analysis and its automation is an important thing. 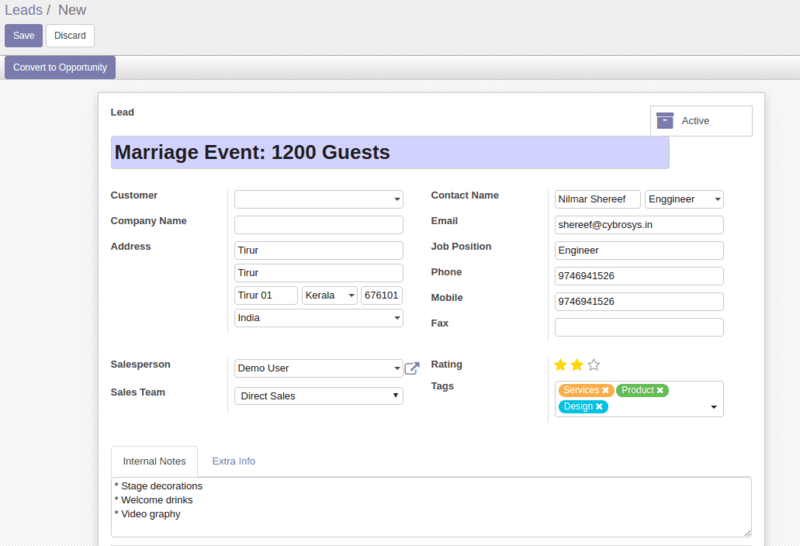 Suppose, If you are running an event management company, the leads are nothing but some queries on your service from a person who is getting married soon. Simply, we can say that lead is the first step in pre-sales. Pre stages of a sale are strictly depended upon the nature of the company. The core idea of these steps are converting all possibilities or Leads to a successful sale. 2. Follow up through calls/emails or any other medium. 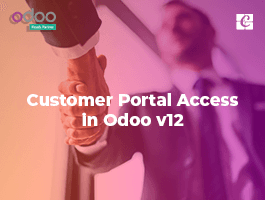 This blog describes how to successfully manage a Lead and convert it into a business with Odoo ERP. 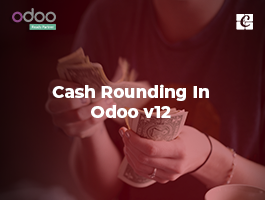 As we know Odoo ERP has an excellent Lead tracking and analysis system by default. 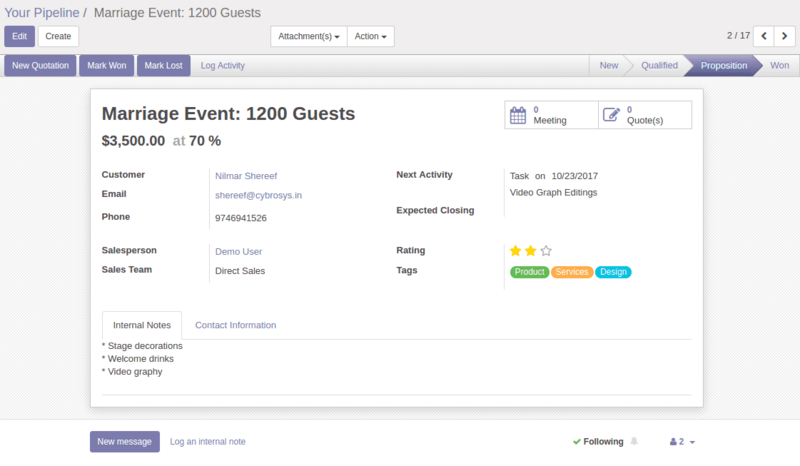 - Add leads and follow up the leads using next activities. - Mark as won and confirm the sale order. 1. Select manual entry option to get Leads menu under Sales. System user (sales user) can generate their leads under Sales->Leads menu. There he can provide basic information about the query or lead. Important fields are listed below..
Internal Notes: Here, we can add a detailed description about the lead. 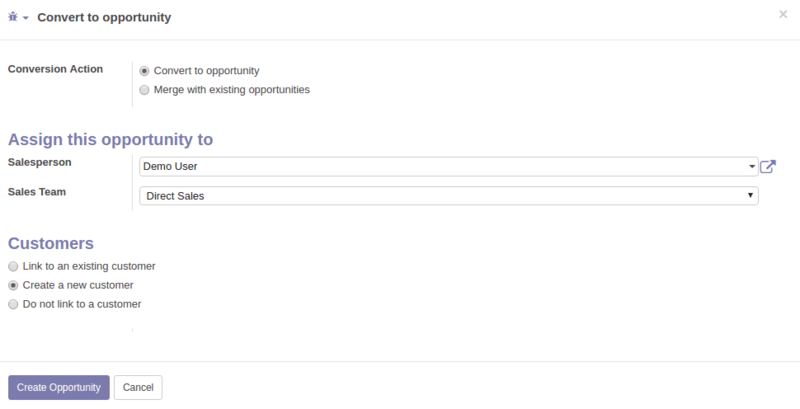 Opportunity is the next step of lead, we can convert a lead to opportunity by pressing “Convert to opportunity” button from the lead form (see the above image). Convert to opportunity button will give us a wizard like below. Here we can change the customer, merge duplicate leads, change the sales person, sales team etc. It is after we have got a confirmation about the business possibilities of the Lead, we convert it to an Opportunity. So, now it is not a “lead”. It transformed to an opportunity. We can put these opportunity record into a user-defined pipeline to close the deal. You can see the record is now listed in opportunity pipeline. 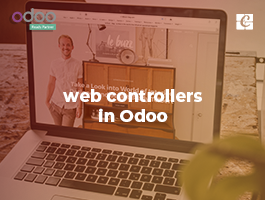 The user can drag it to the next stage based on the development on the lead like E-mails, calls, demo etc. 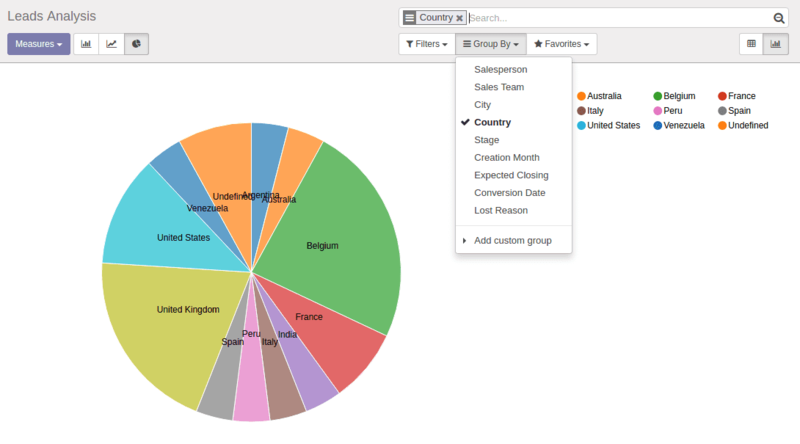 We can view full details of any opportunity in Pipeline by just clicking on its Kanban view (see below picture). On upper right corner of the form, we can see all the stages of the pipeline through which the opportunity should pass. What is ‘next activity’ in opportunity? Next activity is a scheduling record based on opportunity or lead. It may be a task, call, meeting, mail etc. It may have its own deadline and details. The salesperson can close the opportunity in two ways. Where the salesperson should log the lost reason of the lead/opportunity. 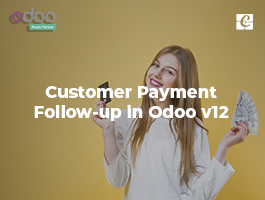 If quotation gets approval by client-side or customer side, we can confirm the sale order and create invoice against the order. 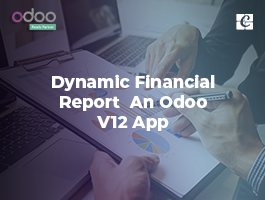 Leads and Opportunities analysis can be done dynamically using pivot dynamic views in Odoo. Some of the reports are given below. 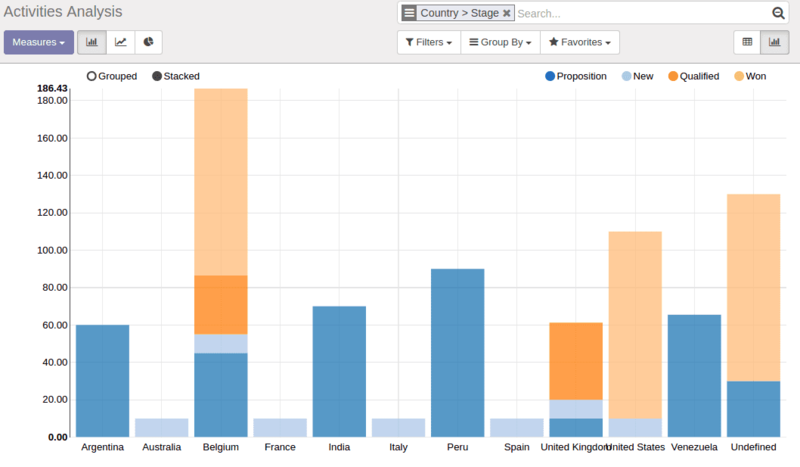 We can use different filtration to customize the report. So let's analyze the total workflow of CRM or lead opportunity pre-sale analysis in a simple diagram. Lead nurturing throughout the sales process will yield greater dividends. 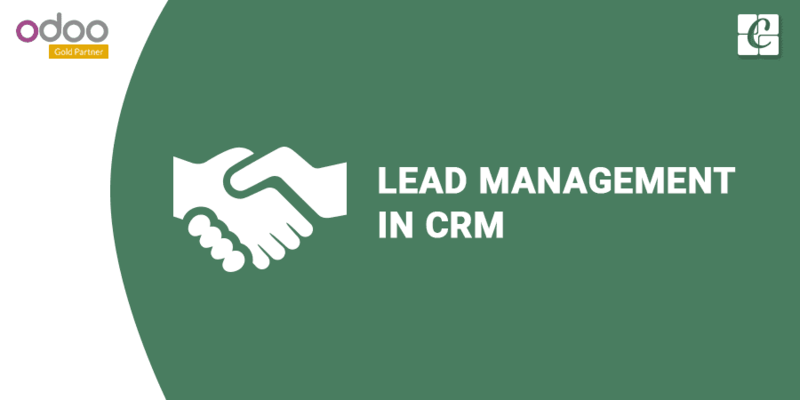 Hence using a Lead Management Software makes it easy to track all the information about our leads. Aritic PinPoint is a good Lead Management Tool that I have come across, can you suggest few other tools.